Despite the fact that the scientific basis for greater occipital nerve blockade (GONB) has been known for decades (Penfield in 1932, Leriche in 1943 and Rowbotham in 1946 all documented the potentials) and that peripheral nerve blocks are used substantially in other branches of medicine, the therapeutic use of GONB in clinical practice is a relatively novel, non-pharmacological, adjunct mode of treatment. As such, it represents fairly unchartered territory, without the bulk of data that many medications have behind them. Nevertheless, GONBs have been proven to be an easy, safe and — through anecdotal evidence of patients — very successful mode of treatment for a range of conditions within the spectrum of "headache". 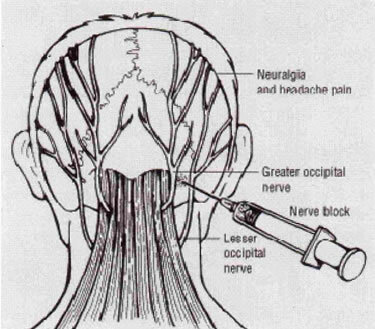 In a greater occipital nerve block, a local anaesthetic, with or without a corticosteroid, is injected directly into the nerve to alleviate any head pain originating from the nerve and also extending beyond the region described above. Local anaesthetics are agents that act on sodium channels to impair nerve conduction and either 3-5ml of 1-2% lidocaine or 2-4ml of 0.25-0.5% bupivacaine is used for the procedure. Dr Cockerell usually employs the former. In addition, Dr Cockerell injects the nerve with Depo-Medrone, a corticosteroid solution containing the active ingredient methylprednisolone. The dose and properties of both the local anaesthetic and the steroid are dictate how long the block lasts. However, the type of headache suffered and the patient's individual physiological factors also play a huge role in determining the efficacy of the block. There is no standard protocol for GONBs but most doctors will follow the same procedure. The patient is positioned sitting with the head either vertical or slightly flexed. The nerve is located and felt along the superior nuchal line and the doctor will feel for the neighbouring occipital artery to ensure accuracy of the injection. The scalp will be prepared with an alcohol rub and the solution is then injected with a 23/25-gauge needle. Approximately 1cc of the solution is injected into the nerve and another 1cc will be placed on either side of the nerve. Depending on the patient's condition and at the discretion of the doctor, either one or both occipital nerves (i.e. left and/or right) will be injected. Pressure is maintained over the injection site after the needle is withdrawn in order to bathe the nerve trunk with the mixture and maximise any effect. Time must obviously be given to allow the anaesthetic to work and the patient is usually re-evaluated after approximately 15 minutes before being discharged home. Various side effects can occur but these are unusual, given the superficial nature of the actual nerve. Some patients report local tenderness at the injection site but this should subside within hours to a couple of days. Very rarely, transient dizziness, syncope, localised alopecia and a worsening of the headache can occur. ​The procedure therefore is relatively pain-free, safe and easy to perform. The International Headache Society2 associates the use of GONB with relieving occipital neuralgia (which presents with migraine-like symptoms) but the extent to which this plays a role in all cases of chronic daily headache and migraine is unclear and the procedure is therefore used for many patients who could potentially benefit. In the UK, the National Institute for Health and Care Excellence have yet to include GONBs in their guidance and protocols on the treatment of both chronic headache and migraine. 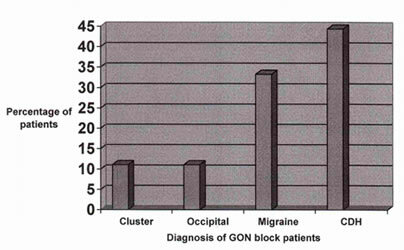 In clinical practice, GONB is usually only considered in migraine or headache patients in whom primary preventive techniques and pharmacological agents have either proved completely unsuccessful, of limited success or where the patient is unresponsive to them.4 Therefore, Dr Cockerell will usually recommend GONBs after patients have tried one, or usually a few, medications without complete resolution of symptoms. The mechanism of action in resolving symptoms is fairly unclear and various hypotheses have been suggested although none have been proven. These include a breaking of the pain cycle that causes head pain and a "winding down" of central sensitisation by reducing the afferent nerve input with the nerve block. Similarly, the efficacy of GONBs is unpredictable too. Whilst the placebo effect undoubtedly has a role, most will agree the procedure causes an acute physiological relief of migrainous symptoms for the vast majority of patients. Few studies have been done on GONBs and none of these has been randomised, controlled and standardised. Hence quantification of efficacy is ambiguous and within wide intervals. However, Caputi & Firetto4, Gawel & Rothbart5 and Peres et al6 all report between 14-85% effectiveness of GONBs for up to 6 months for various forms of headache and migraine. In reality, some patients will only experience benefit for 3-4 weeks after the injection whilst others will require multiple nerve blocks. Caputi and Firetto4 gave a maximum of 10 consecutive nerve blocks to some patients on alternate days in order to exert an effect, and efficacy very much depends on the individual patient and their condition. More controlled studies into GONBs are needed in the future for more conclusive data. In an audit of Dr Cockerell's patients, all those referred for GONB were only done so after having tried multiple pharmacological agents to resolve their symptoms. As mentioned, Dr Cockerell’s choice of agent for GONBs is Depo-Medrone (methylprednisolone injections) with added lidocaine for anaesthetic effect. All patients had established diagnoses of head pain on the headache-migraine diagnostic spectrum. Fig 3: Relative proportions of positions of GONBs performed by Dr Cockerel. 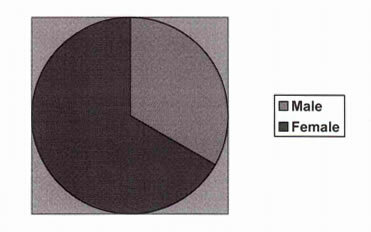 Of the group, 33% of the patients audited were male and 66% female. The location of the GONB was determined by Dr Cockerell on the basis of the presenting symptoms of the individual patient; 14% had left side blocks, 21% had right side blocks and 64% had bilateral blocks performed. As is evident from the information above, there is great overlap of medication use in headache and migraine patients and the vast majority of patients referred for GONBs will have a history of polypharmacy (often without or with limited success). Outcome and associated success rates are extremely difficult to measure in patients who have had GONBs and a vast number of clinical results are possible. Broadly, these can be classified in one of three ways. Some patients will feel no effect at all from occipital nerve blockade and symptoms will continue as before. Others will experience complete remission with a resolution of all symptoms. However, the vast majority lie somewhere in between. Often symptoms resolve after GONBs for varying periods of time, from weeks to months or years. As the blockade wears off, symptoms can return — either of the same severity as before or with diminished intensity. Dr Cockerell will often therefore repeat the GONB. Some patients will require only one repeat injection whilst others can have 6-8 repeated procedures over a period of years. After multiple GONBs, patients can then enter the categories of being in remission or the headaches returning as originally. Hence, results are unpredictable and physiological responses help to determine success of the procedure. To this extent, GONBs should be viewed as a clinical tool that can provide therapeutic and holistic benefit in tandem with other forms of standard treatment and are of key analgesic potential but are not to be relied upon as a mainstream of achieving resolution. Originally published May 2013, updated February 2016.